Definition: Employee training and development implies a program in which specific knowledge, skills and abilities are imparted to the employees, with the aim of raising their performance level, in their existing roles, as well as providing them learning opportunities, to further their growth. Training implies a process of upgrading an individual’s knowledge, skills and competencies. When an employee joins the organization, he/she is given job-related training to ensure satisfactory performance of the tasks and duties assigned, so that the employee can contribute more to the organization. On the other hand, development has a long-term view. It is all about preparing the employee for the current as well as future jobs, by providing them with learning opportunities to increase their capacities, to undertake more challenging and complex tasks. Training and Development programme facilitates better utilization of an organization’s resources, i.e. men, machine, material and money. It ensures less wastage, with respect to resources and time. When a worker is skilled and trained enough, the amount of wastage will be less, as well as the learning time will be reduced, and the work will be performed in very less time. 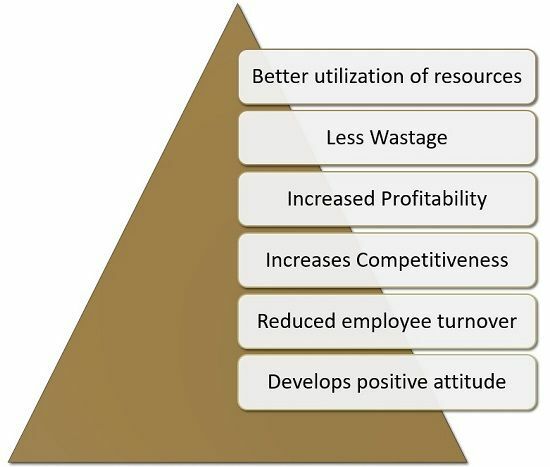 It improves the performance of the employee which results in increased profitability. The employees learn new and improved methods of performing an activity, which helps the organization to survive, compete and grow in the market. It results in a reduction in employee turnover, idle time and absenteeism. It develops a positive attitude in employees towards the work and organization, as well as boosts their morale, which helps them adapt themselves to the changing environment. An individual focuses more on career than a job. And so, the skills and knowledge acquired from the training add to their resume. Improved performance is a sort of motivation for an individual which encourages them to perform much better than before and contribute to the organization’s success, which ultimately increases their incentives. When an employee is trained enough, he/she will handle any situation or problem and deal with the challenges in a better way. Training makes workers machine or equipment-friendly, which reduces the number of accidents during the process. It helps the employee to stay up-to-date with the technological changes. It results in job satisfaction and boosts employees morale. Training is often imparted to middle or low-level employees. In contrast, the development programmes are specifically designed for the employees working in higher positions in the organisational hierarchy. Skills: Basic skills should be imparted to the workers, to help them operate the machinery and other equipment correctly, with least wastage and damage. Education: It aims at teaching theoretical concepts along with providing a hands-on experience to the employee. It also improves their judgement and reasoning power. Development: Training involves development, wherein more stress is given on increasing knowledge, rather than the skills. Here, knowledge means an understanding of the business environment, human relations, management, etc. Ethics: Ethics are the principles that regulate the conduct of an employee, at the time of undertaking any activity. So, the training and development programme must provide knowledge regarding ethical conduct. Change in attitude: One of the important benefits of training is the attitudinal changes in employees. Attitude indicates the feelings, outlook, reaction and beliefs of the employee towards others. It has a great impact on an employee’s morale, motivation, loyalty, commitment and satisfaction. Extraordinary Skills: Apart from basic skills, training and development scheme should impart some other skills to higher level employees such as problem-solving, decision making, industrial analysis, etc. Literacy: Here literacy is not related to education, but proficiency in the corporate language and he/she must be fully aware of the corporate culture, to deal with international clients and customers. 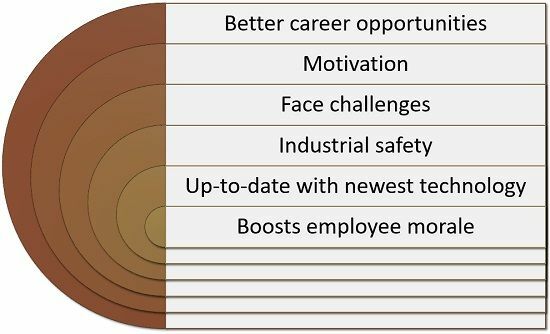 In a nutshell, any activity that intends to enhance the present or future performance of an employee, by improving his/her ability through the process of learning, by changing approach, sharpening skills, strengthening competencies and increasing the knowledge base, comes under the ambit of training and development.